A 11 day old presents to the Emergency department in acute respiratory distress. His mother states that his SOB has increased markedly over the past 24 hours. 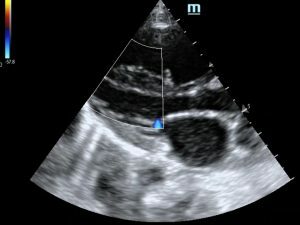 While on the way to hospital he has an episode of tachypnea cyanosis and not breathing for 5 seconds. He has been feeding poorly all day. He has not had a fever. Iv access is obtained and he is given high flow oxygen. Coarctation of the aorta is suspected. A point of care ultrasound is performed. PLAX view : The RV and LA appear big compared to the aortic root. They should be of approximately the same size. The RV cavity is big compared to the LV cavity. PSAX : There is flattening towards the LV of the interventricular septum (D shaped left ventricle). 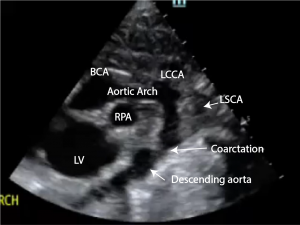 Apical 4CV : the RV is almost the same size as the LV. There is poor longitudinal contraction of the LV. 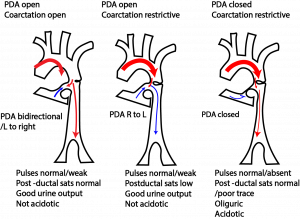 There is flattening of the interventricular septum in systole. 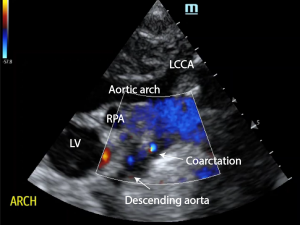 In summary, the baby has coarctation of the aorta with evidence of pulmonary oedema and right heart strain. He is started on a prostaglandin infusion (prostin 10ng/kg/min) , is subsequently intubated and given ionotropic support in the neonatal intensive care. 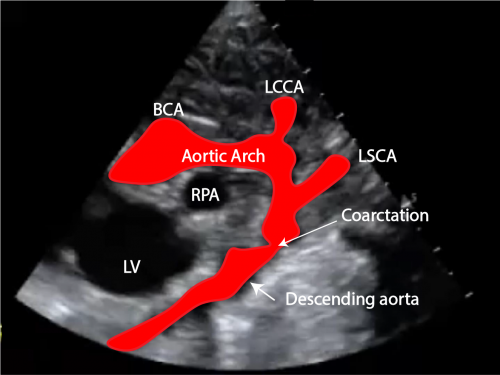 Coarctation of the aorta (CoA) is thought to develop from arterial ductal tissue extending into the aortic lumen. 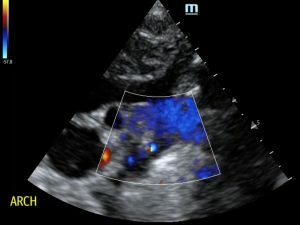 After delivery, the increase in arterial P)2, the drop in circulating PGE2 and the drop in blood pressure within the lumen of the ductus (caused by the drop in pulmonary vascular resistance) promote closure of the ductus arteriosus. 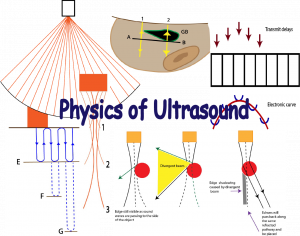 pulsed Doppler ultrasound study JOHN L. BASS, M.D., JAMES M. BERRY, AND STANLEY EINZIG, M.D., PH.D. 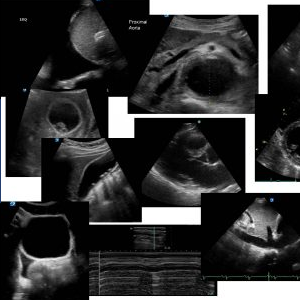 This entry was posted in Cases, Aorta, ECHO, Paediatrics. Bookmark the permalink.